I hope your elf arrived and got your kids excited for this holiday season! Remember, I am posting these a day ahead of time. Today your elf should arrive and tomorrow will begin the exciting adventure of biblical virtues! The first biblical virtue we are going to focus on is generosity! It is so much more rewarding to give than to receive. Giving to others and sharing are two words that don’t always exist in the world of toddlers. You know that all too familiar word “MINE!” Toddlers must be taught how to share and how to give, and why it is important. What does the word generosity mean? It means to be willing to give more of what you have to those in need. It means going the extra mile. It means showing kindness to others. Jesus said it is better to give than to receive. There is something that happens in our hearts when we act generously. Joy fills our hearts. That joy is the Holy Spirit telling us that He is pleased and that it makes Him happy when we are generous. Read the parable of the rich fool in Luke 12. Talk about the choice that the rich man made. Was it a generous one? What actions could he have taken to be generous? Whatever activity you choose, be sure to talk about how being generous is pleasing to the Lord. He commands us to help those in need and to have a heart for those with less. It is great to do generous acts such as those above, but be sure to talk about ways your child can be generous on a daily basis too (ex: sharing toys with friends). Being generous makes our hearts happy and it makes the Lord happy too! Thank you! I love your ideas. Have a question? Do you type up a letter everyday with the activities we plan to do and place with the elf? Thank you for your Elf on Shelf Jesus style blog! It is nice to see others using the Elf in a positive way. Our first year we did silly-not naughty-things with our Elf. Last year I turned it into biblical teaching moments. My boys go to catholic school and get to talk about Jesus everyday! They loved seeing a new Bible verse everyday. Our Elf would have a special word from the bible verse for them to focus on that day and a special assignment to carry out. 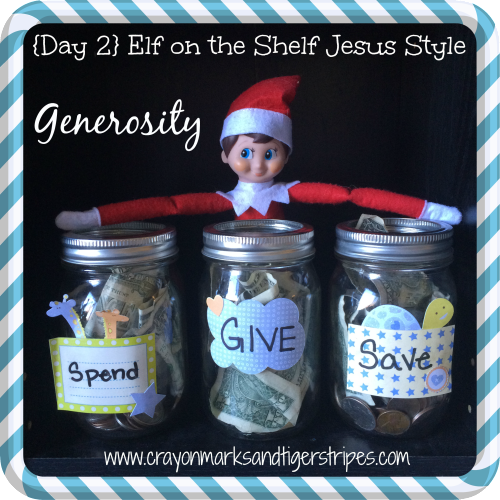 This year our Elf is focusing the whole month on giving. Today their challenge was to give thanks to 2 adults at school who make it a great place to learn. They each chose 2 adults and thanked them for teaching, for doing a great job serving lunch, for being a great principal and for teaching us Spanish. I even got into the act and thanked our secretary and recess aide. The boys were so excited for this challenge. Tomorrow we are giving money by buying presents for toys for tots. Our Elf is giving each child an extra dollar and he is challenging the boys to use their own money to buy the gifts. I used your bible verse from Acts to start out the letter from their Elf. It is perfect! Thank you again and God bless! That is AWESOME! What great character you are building in your children! I love it! Hi! Loved elf on the shelf Jesus style last year and wondered if there is a list of your plans for the 25 days this year so I could plan ahead. Is this available somewhere and I just can’t find it or is it just posted a day in advance? It is posted a day ahead of time. It is designed so that you do not need much prep time! However, I am considering turning it into a free ebook for next year! You are so welcome! Thank you for joining us! I am following along with this Elf on the Shelf Jesus Style and I couldn’t be more excited! I used the arrival letter you posted yesterday and my kids loved it! They are so excited for the rest of the month. I wanted to thank you for doing this. I wasn’t really into getting an Elf on the Shelf this year because I felt like it took away from Jesus to much. But you found a way around that 🙂 this is an amazing idea and it means the world to me that you are sharing it with us. THANK YOU THANK YOU! !